Managing your companies' computers, network, servers, email, web-space, security and smart-phones consumes precious time and valuable resources. With the expert help of Just Right Computer Consulting, you and your team can get back to focusing on your business with confidence. 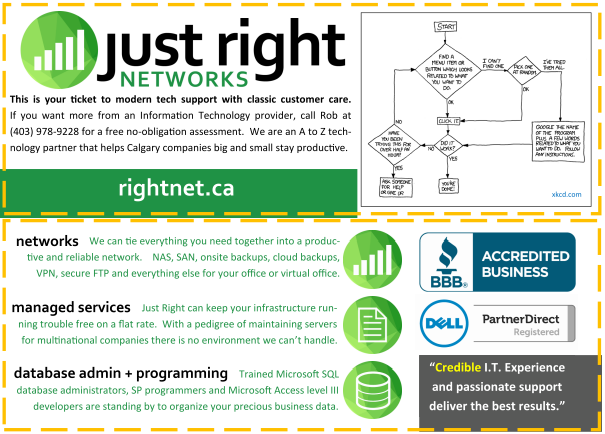 Just Right Computer Consulting is a trusted partner by many of Calgary's local and multinational businesses for almost a decade. 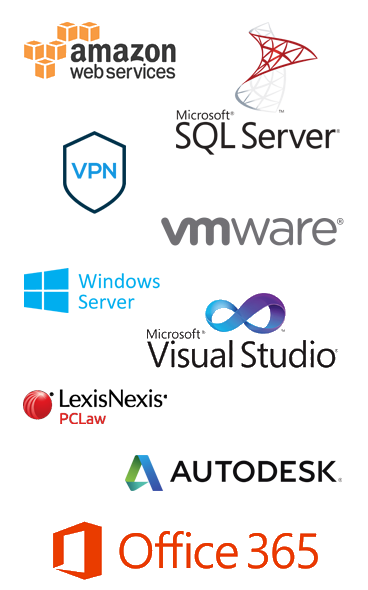 We offer some of the very best in end-to-end IT infrastructure solutions for small to medium businesses. With a pedigree in multinational and enterprise IT environments, Just Right Computer Consulting scales perfectly with growing companies who want to work smart and stay organized. Specializing in project based technology solutions we can evaluate and purpose your existing systems to save you money and provide you with worry free IT longevity. Our specialized staff are also programming experts that can customize internal controls for your systems to manage HR, time and attendance, payroll, data mining, reporting, CRM, and ERP. Just Right Computer Consultants strive to deliver service and workmanship of the utmost quality. We will not rest until the job is done right! Credible I.T. experience and passionate support deliver the best results. "For I.T. support to be effective, it should know and understand the business it is supporting." Just Right has a proven track record of providing Information Technology solutions to businesses big and small for over 10 years. Our difference is that we give all our tasks and assignments the necessary preparation and pre-planning attention. The result is a project done right the first time with little to no firefighting or problem solving afterward. Still using Excel spreadsheets for reporting, quoting, invoicing and record keeping? Streamline all of your operations by moving to a centralized database! Just Right has been using Microsoft SQL Server, Microsoft Access and Terminal Server to maximize business potential since 2002. A custom database is more affordable than you think, ask me how. Prepaid block hours are available at discount, these don't expire. Regular grooming schedule for the production servers ensures reliability, up to date security and patch management, regular backup/restore testing and current change-management paperwork. We put our heart and soul into every system we maintain. Just Right's clientele appreciate our discretion and professionalism. As such, references are available by request only. © 2007-2015 Just Right Computer Consulting. All Rights Reserved.